I’m sure all of you know how much I love prints! When I first laid eyes on this, I knew I had to have it. It’s such a funky looking top, it’s hard to miss! I know a lot of you are looking for ways to spice up your wardrobe. Printed tops in simple silhouettes like this one are perfect. They can easily make, say a boring corporate attire, a whole lot more interesting. If I were working for a company with a dress code, I’d probably pair this top with colored trousers and a crisp white blazer. If you’re not that confident in mixing and matching, just follow what I always say: take a look at the colors of the print and pick one from there. But since my boss (a.k.a. myself) is pretty understanding and lenient, I can pretty much wear whatever I want. No dress code for me! I just wore my top with a pair of shorts. No trousers! The heat nowadays is just insane! Just thinking about wearing pants is making me sweat. Well, not really but I’m sure you get my point. Of course, I went crazy with the color-matching again–everything from my necklace to my arm candies down to my bag and shoes are all in yummy colors. 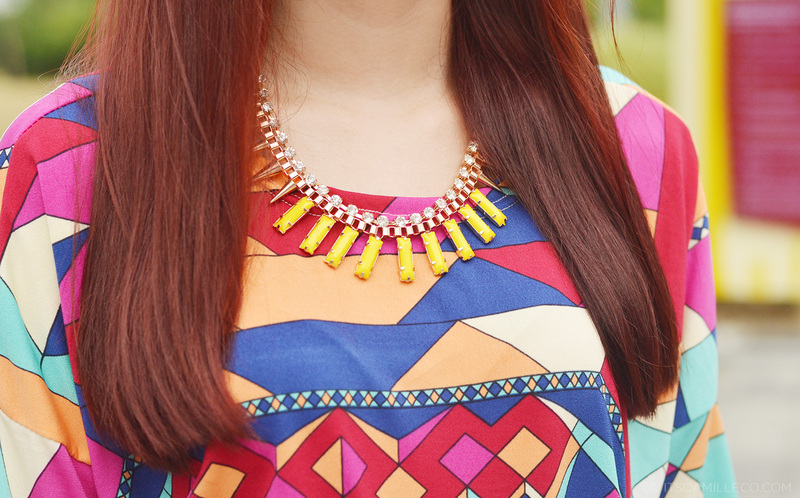 With such a bright and bold print like this, it’s hard for me not to get color-happy. It’s practically calling out to me. Btw, Feet For A Queen has a new website! Check it out here. I love how you mix inexpensive jewelry with more high end brands and make it looks so elegant and fun! Love love love your style!! Love the geometric print of the top! Pretty pretty top! Love your overall outfit! Very colorful! I see that you even matched your lip colour to your outift! Love it, Ms. Camille! You look stunning as always! And it’s been a while since I’ve left a message to you here, just wanted to say that your red hair is a nice change! How do you manage when your bangs get long, hurt your eyes and have to time to go to the salon? Mine are in an awkward stage, ugh. So bright and colorful, it’s really match the season. :) Refreshing! Love the bright colours and fun print, you look amazing! oh la la! u’re so colorful.. hehe love it! Hi camille you’re so pretty on this pictures by the way what camera are you using? Sooooo colorful =))) Summer na summer! Such a wonderful and very youthful mix of accessories… love this! The prints and colors are very positive to look at :) Nice one Ms. Camille! Hi cams, i just wanted to know, (although out of topic na kasi. LOL) where can i buy Celine bags here in the Philippines? I tried to check at Rustan’s and Shang, but to no avail T.T. or if it’s online, can you recommend trust-worthy online sellers? It does! :) Thanks Farah! Love the colors so much. Oddly enough, the outfit reminds me of ice cream! I really love the way that you’re able to make so many colors work well together. Good job! Now that you mentioned it, it does look like ice cream! Haha! :) Thanks Dolly! The first thing that came in my mind is that, your outfit looks soooo much like how Barbie use to dress up. Awww thanks Katrin! :) The print and colors do remind me of Barbie!